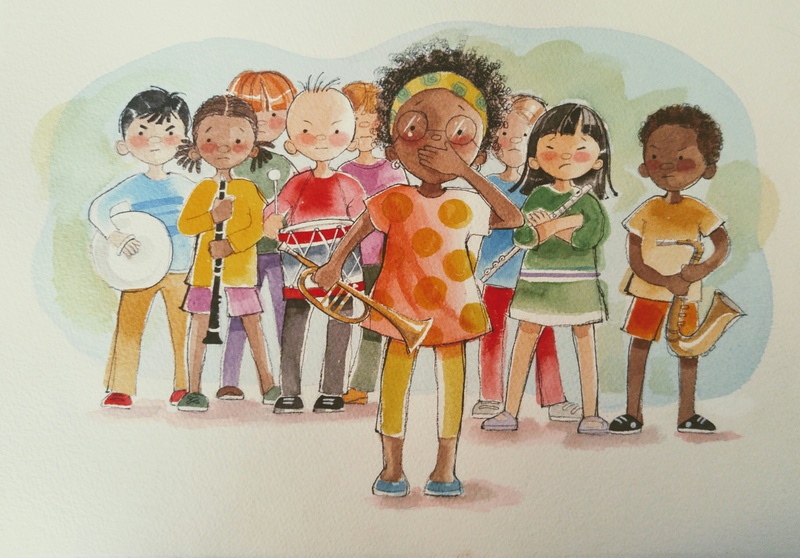 Artist / Illustrator Sylvia Walker, a lifetime artist who has lived in Southern California and Philadelphia PA, brings a natural affinity to the artistic painting of multicultural images, especially children. I express myself in a variety of media, including watercolor, pencil, ink, and acrylic on canvas. After twenty years of experience illustrating children’s books for publishers Scholastic, Harper Collins, Penguin Putnam, additional clients include National Adoption Center, Keystone Health Partners, Hallmark Cards, Simplicity and McCall’s Pattern Companies, and United States Post Office. I am excited to begin focusing on writing and illustration picture books. 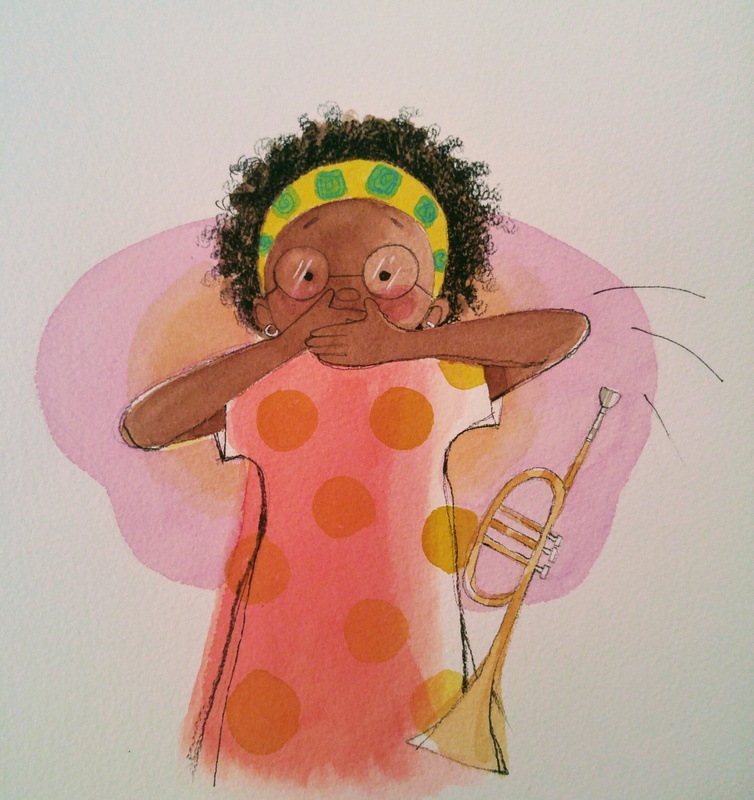 Sylvia sent in three illustrations from a story about a girl who loves to play her trumpet but when she plays her trumpet, she hiccups! HIC! HIC! Wow, Sylvia – I’m having trouble finding anything to critique in these pieces! 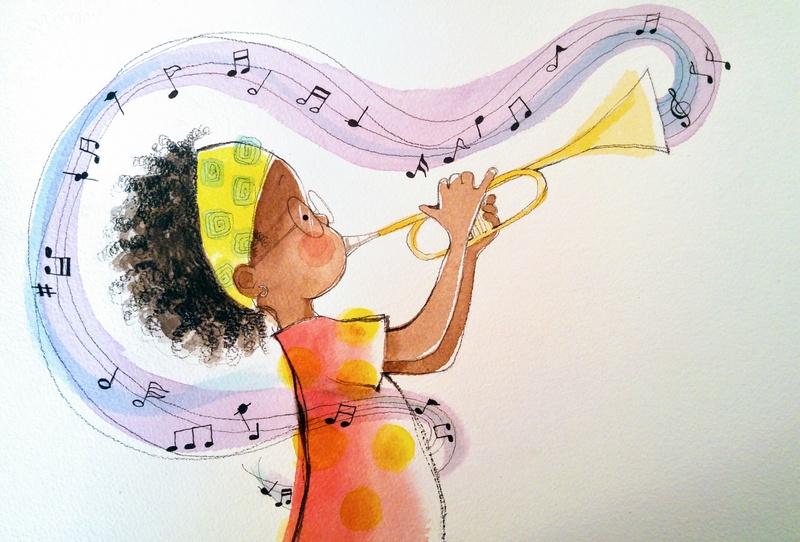 I just adore this first image of her playing the trumpet. The colors and the swirl of the music around her – brilliant! Even though she is standing still, there is so much movement and emotion here. I just love it. I also love her rosy puffed-out cheeks and the way her polka dots are seemingly jumping off of her shirt; as if they are part of the music! Some people take issue with dots for eyes (my Mom, Chris, for one!) but I think that they are totally fine. And just with that little wisp of an eyebrow, you have given her face and her eyes (even as dots!) a ton of expression. I would use this image as a great example of masterful use of white space. The contrast and balance is perfect, and the shape you have made around her with the music and the musical notes, creates a roadmap to the image – guiding the viewer’s eye around the page just as it should. Your color choices – making her warm hues and the music cold hues have really helped you visually tell the story here. And although they are hot/cold, they compliment each other beautifully – especially where they begin to blend as they wrap around her. Also, bravo for remembering to show a little light reflection in her glasses – that gets overlooked a lot! In this next piece, I’m glad I knew ahead of time that she has the hiccups, because I would have thought that it was either that, or that she was about to throw up! Ha! Again, the expression is wonderful, and her hands dramatically over her mouth tell us exactly what is going on. This piece feels a little “tighter” to me than the last. For instance, the sketchy line and loose-ness of her headband is gone, and the polka dots on her jumper are more solid and less playful feeling. The watercolor seems more dense, and it doesn’t provide the same contrast as the first image. Perhaps it’s the color wash that’s behind her, too, that is blending things together a bit too much. Because it’s the same colors as her, she gets a little lost in it. I wonder if it’s necessary? If these two pieces were to go side-by-side in a picture book, I would recommend that you have fun with the second illustration – putting her on a different plain than in the first. For instance, what if you did a super zoom on her face and arms on this page, so we can really see the surprise/embarrassment on her face, and we are pulled into that moment with her a little more by being so up close! That would add intrigue to the visual story a bit, and it would switch up the way we are looking at her – as both of these first two images are the same ¾ of her body. The final image, I loved seeing all of her bandmates!! What a nice, and realistic mixture of little faces – and we all know how they feel! Their expressions are fabulous – some are annoyed, and some are concerned, and their faces and body language are clear. My only thought about the group as a whole is that they are all about the same height and body type. I would not have noticed something like this, if it wasn’t for my daughter’s elementary school class, in which there are some really tall kids (who look 10!) and some little peanuts (which my son will be!) and some super lanky beanpoles and some who are a little softer; having not yet shed the last of their baby fat. She and her classmates look about 7 to me? Or around there? 2nd graders seem to be all over the place in height and weight – so that’s my only suggestion there. Because this one is bigger and more detailed, it might be nice to take that a step further, and in addition to the color wash in the background, maybe sketch a hint of a music room, or a stage (depending on where they are)? Perhaps a music stand somewhere in there? That would give the viewer more story by way of environment, and that’s important! Are they outside? Inside? In front of an audience? These are all things that can be shown with just a little hint of environment in the background. Overall, I really adore your style, and the way you draw children. They are so appealing and have a natural, confident way about them – and in the way that they are drawn. They are finished, but not tight or stiff, which can sometimes happen between the sketch and final illustration stages. Adorable outfits and color choices here, too. Especially with her blue flats – they are so cute!! This is a story that I would love to read – I’m so intrigued! Thank you for sharing your wonderful artwork, too. I look forward to seeing where these pieces lead! 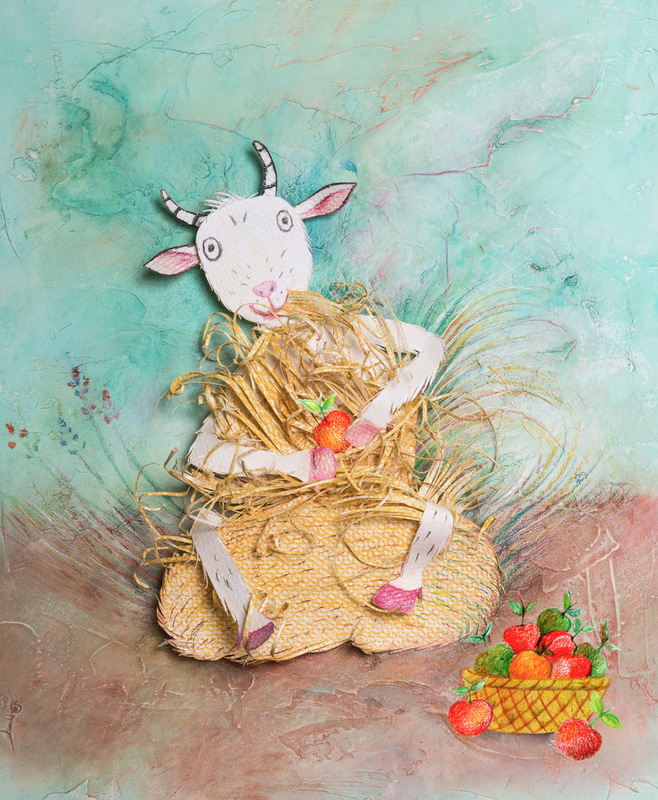 Thank you, Christy for taking the time to review Sylvia’s illustrations. Your thoughts were very informative. The CAT Agency, Inc. is the first mother/daughter agency in the business! A trained artist herself with a BA in Fine Art, Chris Tugeau has been a pioneer in the children’s illustration industry for over 25 years. Since opening her own agency in 1994, Chris has enjoyed representing many talented artists, and has been an active part of the illustration community; writing and presenting for SCBWI regions around the country. She is also the author of SCBWI Illustrator Guidelines. A veteran artist and rep, Chris is an advocate for ethical fairness and the bright future of children’s publishing. She’s also a mother of 3, a grandmother to 8, and best friend to husband, Bill. Daughter, Christy Tugeau Ewers, has been rooted in the children’s literature industry since Chris started the agency in 1994, and she has been surrounded by artists her entire life. Aside from her mother, her brother, Jeremy Tugeau is an exceptional fine art and children’s illustrator, represented by his wife, Nicole, at Tugeau 2. Christy’s husband, Chris Ewers, is an artist too, as a talented cinematographer and film-maker. With a degree in English/Journalism and over a decade of experience in various creative fields, Christy offers a different perspective to the agency, while maintaining the enthusiasm and love that her mother brings to the industry. Aside from writing, her interests include seaside escapes, very hot coffee and pitbulls named Gertie. And of course, grandchildren/children, Billie & Finnegan, are The CAT Agency’s resident experts and critics. Billie has over 5 years of experience in the world, and has formed a deep love of unicorn literature and all things Pink/Purple/anything-licious. Finn boasts a robust background in cars and trucks, with a specific expertise in MR. TIGER GOES WILD. Billie currently enjoys using every crayon in the box, while Finn likes to spend his free time dancing to The Imperial March (Darth Vader’s theme). It has been amazing watching this story grow, change through many revisions, and now getting to see some full color finishes is WOW! These illustrations are really fun. The first one with the musical notes is so engaging for me! I love the energy. I used to play the trumpet. In fact, 3 of us girls played trumpets and formed a trumpet trio. I used to get a lot of colds and remember having to turn away and blow my nose during a performance. I love seeing Sylvia’s wonderful illustrations and appreciate Christy’s thoughts on them.